Breathing Life into an Old Tank with an Aquarium Reset. One of the most rewarding services we provide is an aquarium reset. In this process we take an old or dirty tank and completely rejuvenate it into like new condition. If you have a tank that has been let go for too long or you’d just like something new and impressive to look at, a reset may be for you. Older aquariums are susceptible to Old Tank Syndrome. The primary symptom of old tank syndrome is the death of new fish that are placed into a long established tank, while the old fish remain alive and apparently healthy. An aquarium reset can prevent the factors that cause OTS. The fish tank is completely drained. We move all livestock to our holding systems at our warehouse. We retain a percentage of your old tank water in order to quickly re-cycle the aquarium. The substrate or sand is removed and discarded. Did you know you should replace your substrate every couple of years regardless of tank condition? For reef or fowlr tanks – Live rock is removed, cleaned and sorted to determine what can be re-used. If applicable, decorations are removed and soaked in a mix of lab strength hydrogen peroxide and water. Completely cleaning and bringing back long lost color. The aquarium is completely cleaned and sprayed down with lab strength hydrogen peroxide. Removing all surface and chemical contaminants. A scratch removal process is performed on acrylic aquariums. All equipment is disassembled, cleaned and tested for proper operation. Bulbs (if applicable) are replaced and checked with a PAR meter. Or we can upgrade to a new fixture. New substrate or sand is installed. Old, and new if needed, Live rock is added with a completely new aquascape. Tank is filled with Reverse Osmosis water as well as salt if needed. All equipment is installed, checked and calibrated to operate properly. In a few days, the tank is tested and once proper levels are attained, livestock is returned. Aquariums are expensive, especially marine and reef tanks. 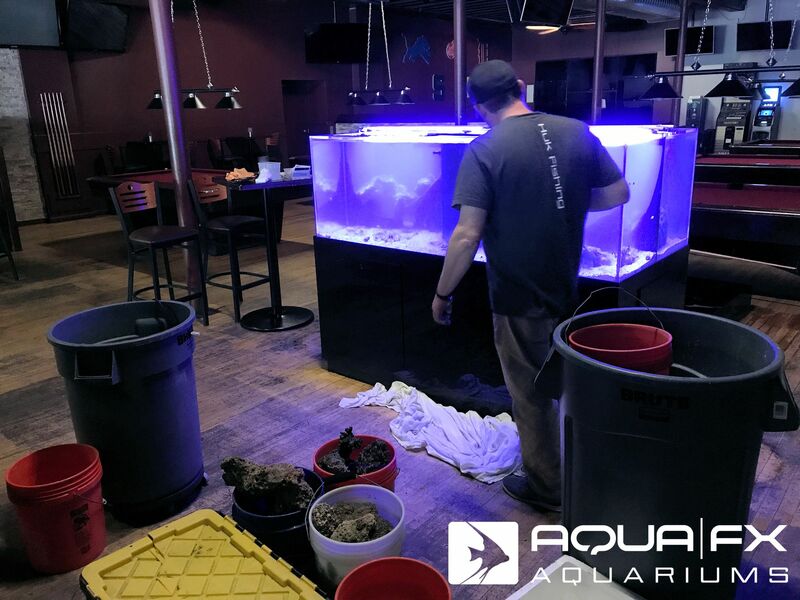 The idea of replacing a tank is a costly one, so Aqua FX Aquariums provides a service that gives you a clean, healthy tank and a new starting point to begin enjoying your aquarium again. Why Choose a Professional Aquarium Service? SO YOU WANT AN AQUARIUM – PART TWO – FRESHWATER, SALTWATER OR REEF?